Located in southwest China, Sichuan is famous for many things – its mouth numbingly spicy food, its cute and cuddly giant pandas, and its stunning natural parks. We based our trip around these three things and added a few more, such as Sichuan opera and an ancient river town called Ping Le. First of all, though, we took in the provincial capital of Chengdu. Our home for a few days was the Lazy Bones hostel, which believe it or not, was a super chill place. 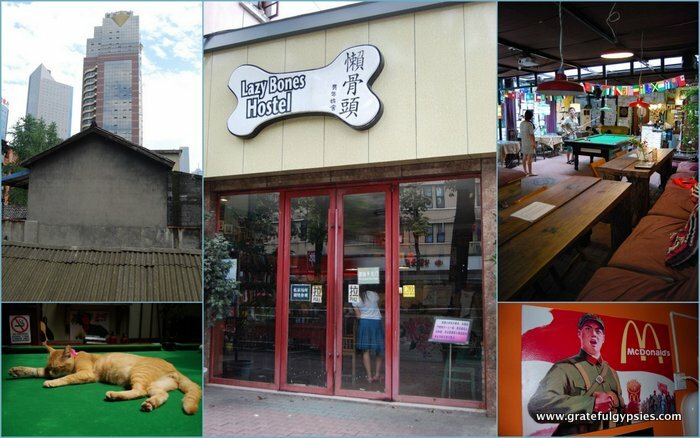 The backpacker friendly hostel got its name from their two adorable cats – Lazy and Bones. A great place to stay in Chengdu. 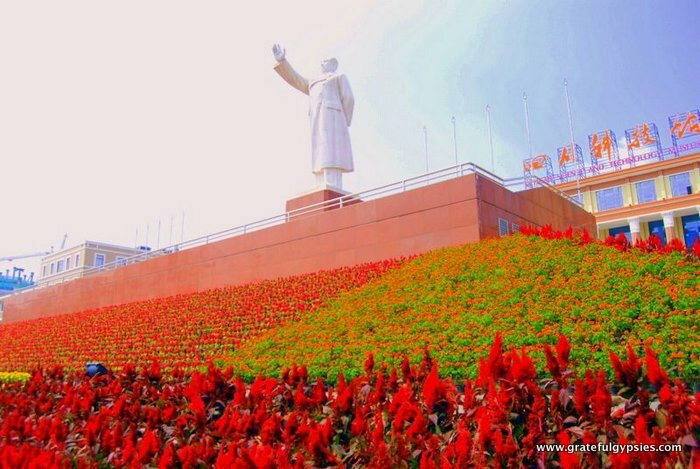 A short and pleasant walk took us to the central Tianfu Square, where a smiling statue of Chairman Mao greeted us. A few blocks away, you’ll find the People’s Park. 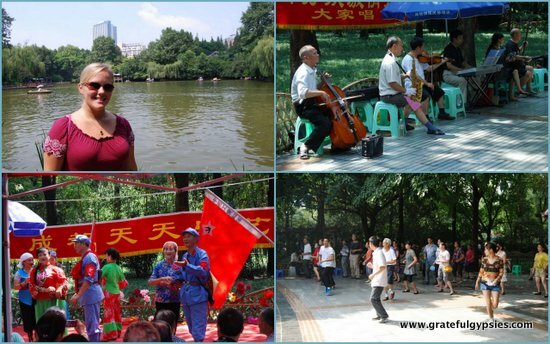 This is a great place to take in the local culture of Chengdu, as huge crowds of locals gather here daily to enjoy a variety of activities – opera, group dancing, sports, playing mahjong, or just relaxing with a cup of tea. 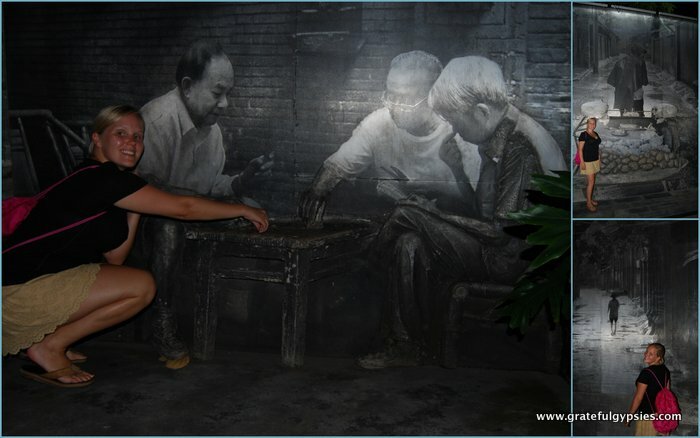 We had a great time hanging out in the park all afternoon, and we enjoyed the more laid back vibe of Chengdu. From our experiences living and traveling in China, it’s become clear to us that the people in the southwest just have a more relaxed lifestyle, especially when compared with the hectic and competitive pace of Beijing life. The Chairman welcoming us to Chengdu. Next up, we wandered around the busy downtown area, where we stumbled upon the city’s YMCA. If you didn’t expect to find a Christian organization in the middle of one of China’s biggest cities, you may also be surprised to hear of the Immaculate Conception church that can also be found in Chengdu. Of course, you’ll find a few Buddhist temples here as well, and we visited the Tang Dynasty era Wenshu Monastery. Christianity and Buddhism are alive and well in Chengdu. Having worked up quite the appetite, we dropped in the famous Zhong Dumpling restaurant right across from Lazy Bones. We ordered a tasty plate of the dumplings, as well as the spicy Mapo tofu – one of Sichuan’s most well known dishes. After dinner, we caught a performance of Sichuan opera, which is most famous for the face-changing portion of the show. 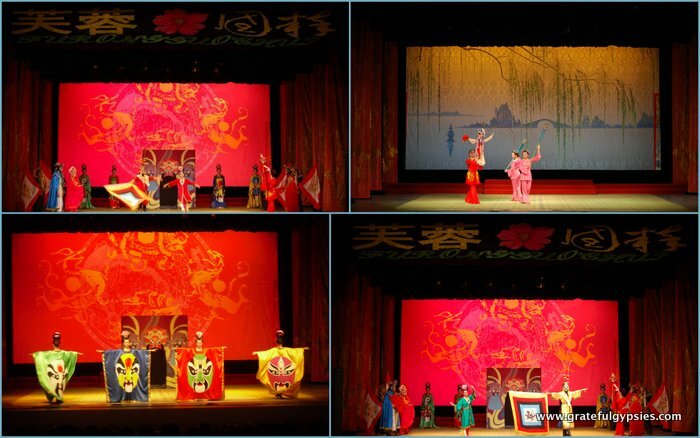 Some scenes from the Sichuan opera. Our highlight video of the Sichuan opera performance. The next morning, we joined the group leaving the hostel to visit the Chengdu Giant Panda Breeding Research Base. This is the biggest facility of its kind in the world, and it is home to over 60 of the giant kung-fu pandas. We watched the adorable and endangered bear cats (the direct translation of their Chinese name) eating, playing, and catching some z’s on the top of a rock. While walking around, we also got up close and personal with a few red pandas, who are free to roam around the path. Tour the Giant Panda Breeding Research base with this video. Back in the city, we went out to try the numb and spicy sensation of Sichuan hot pot. The center of our table featured a huge pot full of oil, spices, and Sichuan chili peppers. We ordered some lamb, veggies, and noodles, and even got adventurous by taking the waiter’s recommendation of cow stomach. Chewy, spicy, and delicious! 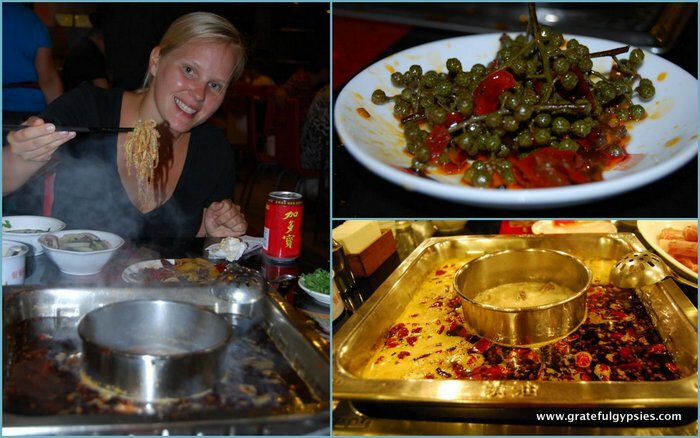 The famous and mouth-numbing Sichuan hot pot. Needing to walk off that huge dinner, we cruised over to the ancient Jinli pedestrian street. Unfortunately, we were too full to partake in any of the local snacks, but we did a little bit of souvenir shopping and even found a beer bar, where we enjoyed some tasty Belgian beer and live music. Rachel goofing around for photo opps. The next day we left Chengdu to visit Pingle Ancient Town, but we would be back for another night before heading up to the national parks. Upon our return, there was a dumpling party going on in the hostel. The Chinese staff taught travelers how to make dumplings, and then we all dug in together for a huge dinner. Rainy weather nixed our plans to head to the art district, and we opted to stay inside to play pool, drink beer, and chat with fellow travelers. 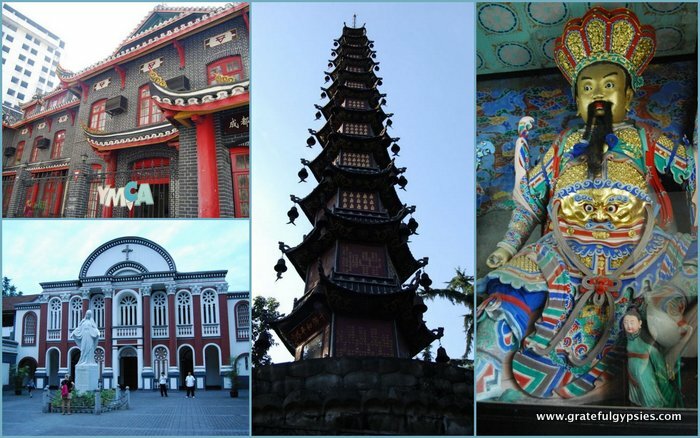 Having visited many of China’s provincial capitals, we can easily rank Chengdu in our top three. It’s convenient to get around, there’s tons to see, the food is incredible, the people are friendly, everything is much cheaper than the mega-cities, and the pace of life is much more relaxed. Plus, there’s so much to do and see in Sichuan, and getting to these places from Chengdu is a piece of cake. Although we’ve already decided to make the move to neighboring Yunnan province and its capital Kunming, we could definitely live in Chengdu. Transportation: You can get into Chengdu by plane, train, or bus, and it’s connected to most major cities in China and even some international destinations. Our round-trip flights from Beijing were about 2,000 RMB each. Get Around: Chengdu had two subway lines on our visit, and they were at work building a few more. There are also plenty of buses, and it’s easy to get a cab as well. For going out to the panda base, it’s best to just go with your hostel, as it is a bit far out of the city center. Accommodation: We stayed at the Lazy Bones hostel, which was a really laidback and cool place to call home for a few days. We had a private double room, which was 170 RMB/night. They were very helpful, the food was great, and they even had Beer Laos dark, our favorite. In addition, they do plenty of activities, such as a dumpling party and a free walking tour of the city. 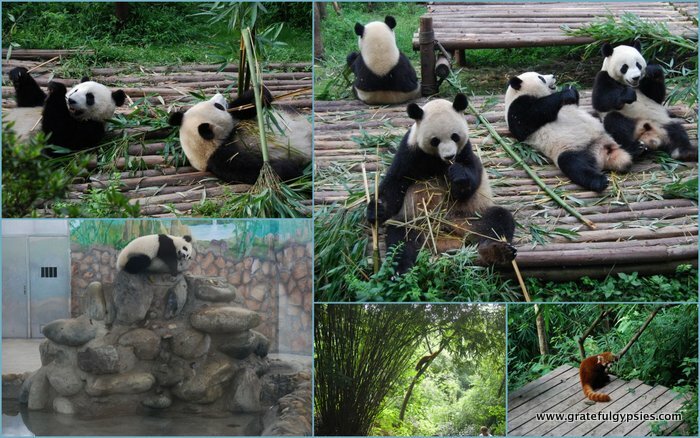 Activities: Most people visit Chengdu to see the pandas, and for good reason. A trip out to the research base can be done in a morning, and you can get back to the city in time to catch a performance of Sichuan opera. Other than that, walking around and checking out the churches, temples, and the People’s Park are all great ways to spend your time. 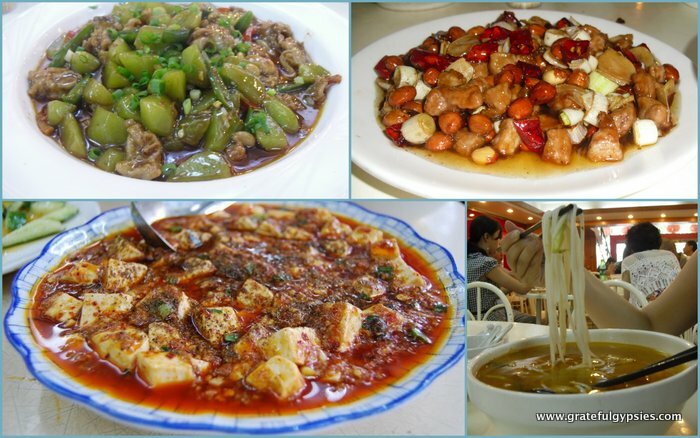 Food/Drink: Sichuan is famous for its food, which can be incredibly spicy. No visit to Chengdu would be complete without a hot pot dinner, and you should also try local specialties such as Mapo tofu, kung pao chicken, or spicy rabbit heads. 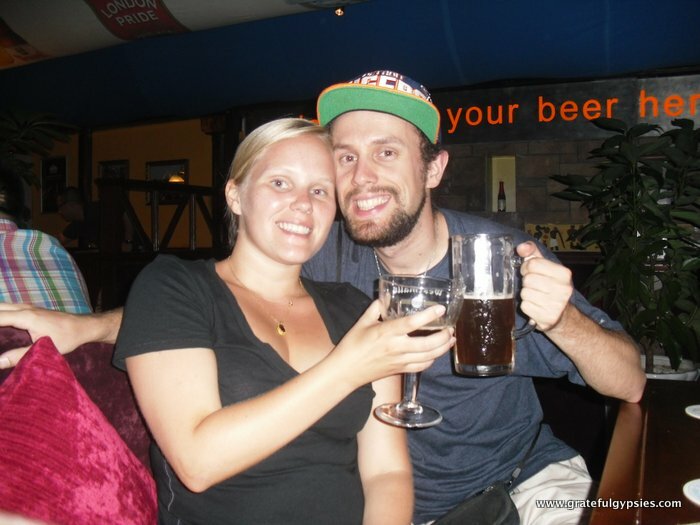 There are quite a few bars in Chengdu, including a nice beer bar that has a wide variety of European brews. Recommended Time: You should give the city itself about three days, but you can also stay longer and include some more day trips to places like the Leshan Giant Buddha or Mt. Emei. In case you just need a little more Chengdu, here’s a video of how to spend a day there.